Karl Kesel is a master chef. Why he hasn’t opened his own resturant is a mystery. 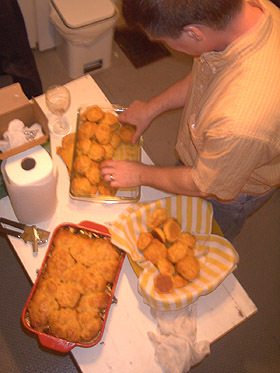 Lucky for studio members, and our spouses, we occasionally get to benefit from Karl’s culinary wizardry. 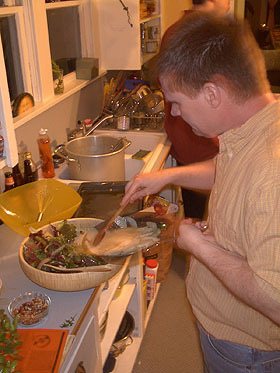 Left: Karl puts thinly sliced pears into his mixed greens salad. He will then top them with the caramelized nuts in the clear bowl to the left. 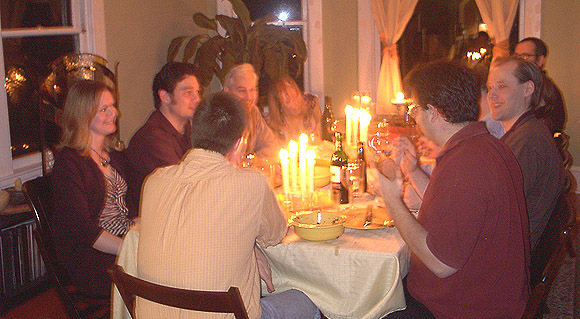 Below: The tasters include David and Robbyn Hahn, Ron Randall, Pete and Rebecca and Celeste Woods, Drew Johnson, Paul Guinan and Anina Bennett, Steve Lieber, and hosts Karl and Myrna Kesel. 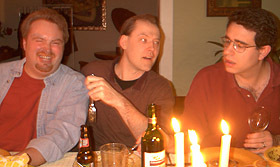 Above: Drew, Paul, and Steve (who has just dead-panned yet another witticism). 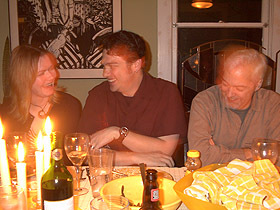 Left: David, Robbyn, and Ron get the joke. 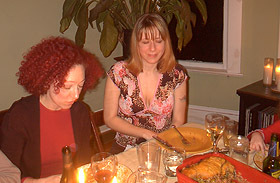 Above: Anina and Rebecca are awed by the chow! 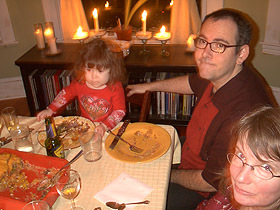 Right: Celeste, Pete, and Myrna await the scrumptious desert . Left: Karl even created his own baked goods for the meal--DELICIOUS! !